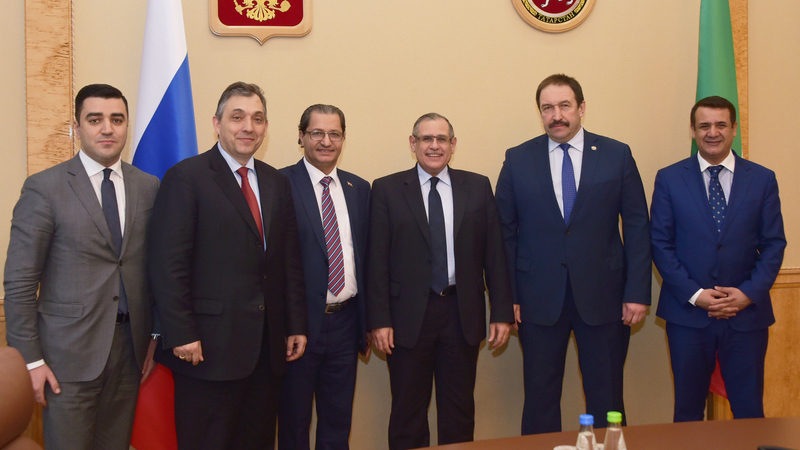 On April 19, at Tatarstan Government House, Prime Minister of the republic Aleksey Pesoshin had a meeting with Ambassador of the Arab Republic of Egypt to Russia Ihab Nasr. On behalf of Tatarstan Government Pesoshin welcomed the Ambassador of Egypt and expressed his confidence that this meeting will give a new impetus to the fruitful and long-term cooperation between the Arab Republic of Egypt and Tatarstan as one of the Russian regions. “Egypt is an important partner for us”, Pesoshin emphasized. He said that the bilateral foreign trade turnover between the parties amounted to 22.8 million US dollars in 2017. Prime Minister noted that the regular flights between Russia and Egypt have been resumed since April 12 this year. “There are all opportunities to expand our cooperation. Tatarstan is one of the leading regions of Russia, it is an industrialized region and we are ready to become a link in the expansion of relations between Russia and Egypt”, Pesoshin said. “We look forward to further developing relationships with the regions of Russian including Tatarstan”, Ambassador of the Arab Republic of Egypt to Russia said. Ihab Nasr is on a working visit in Tatarstan. His meeting with Tatarstan President Rustam Minnikhanov is scheduled.